Shortly after you have been shown into the guestroom and given time to settle down, the Nakai-san in charge will bring a serving of tea and sweets(Chaka or Wagashi). 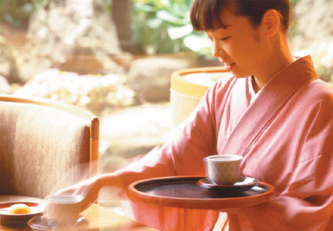 The practice of serving tea and sweets to guests as a gesture of hospitality is not something special to ryokans but is a daily custom which is deeply rooted in Japan. The custom of preparing tea when entertaining a guest has its origins in the art of sado (tea ceremony), and is an expression of welcome. Once the tea and sweets have been served, the Nakai-san will enter into conversation with you, confirming the time for serving meals and providing local information. This series of actions will be carried out by the Nakai-san in a half-sitting posture (chugoshi), but she will sit straight (seiza) when making her initial greetings and also when conversing or taking leave.